Since the end of the second World War, economics professors and classroom textbooks have been telling us that the economy is one big machine that can be effectively regulated by economic experts and tuned by government agencies like the Federal Reserve Board. It turns out they were wrong. Their equations do not hold up. Their policies have not produced the promised results. Their interpretations of economic events — as reported by the media — are often of-the-mark, and unconvincing.A key alternative to the one big machine mindset is to recognize how the economy is instead an evolutionary system, with constantly-changing patterns of specialization and trade. This book introduces you to this powerful approach for understanding economic performance. 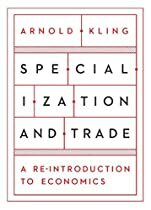 By putting specialization at the center of economic analysis, Arnold Kling provides you with new ways to think about issues like sustainability, financial instability, job creation, and inflation. In short, he removes stiff, narrow perspectives and instead provides a full, multi-dimensional perspective on a continually evolving system.